On which Garmin® navigation devices and with which software will CarteBlanche UkraineNT map work? 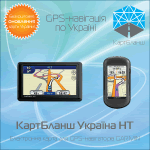 CarteBlanche Ukraine map is compatible with the following Garmin® software products: Mobile®PC and Mobile™ XT. List of compatible devices. Is it possible to use a Cyrillic map in the navigation devices which have been purchased abroad? To use a Cyrillic map you need to have Cyrillic (Ukrainian) fonts installed on the device. If such fonts are not installed, first contact Garmin® dealers in Ukraine in order to modify the device adding a localized firmware version to it. Where can I find a list of map versions with the description of map coverage? How to install the map without MapSource application? Our installer software supports the direct installation of the map onto the navigation device, provided that it is connected to the PC in the removable disk mode. Please follow the instructions provided on the update download page, as well as the ones which appear on the screen when you are using the installer software. Unit ID of your GPS navigaton device can be found in its menu, usually on the same screen, where your navigaton device's software version is shown. Please see User Manual of your GPS navigaton device. Attention! If a map of Europe is preinstalled on you navigation device. A lot of Garmin® navigation devices are supplied with CityNavigator Europe maps, preinstalled by the manufacturer. This map includes a basic low-detailed coverage of the territory of Ukraine. However, when installed on the device, this map has a priority over CarteBlanche Ukraine map and therefore will be used for routing and address search if it is not switched out for the time of your stay in Ukraine. In general, the procedure of switching out the map depends on the menu organization of the device itself. For example, in the popular Nüvi and Zūmo series navigation devices this can be done by choosing Menu (an icon with a wrench) -> Map -> Map Info or Menu (an icon with a wrench) -> Settings -> Map -> Map Info and unmarking the checkbox next to CityNavigator Europe, leaving it marked next to CarteBlanche Ukraine. I have a Macintosh computer. How can I install the map of Ukraine? Please use a computer with the Windows operation system in an Internet café. I have installed an updated CarteBlanche Ukraine NT map for Garmin, and some problems with address search have occurred, while with the previous map version the device used to work properly. This may happen if there is not enough free memory space in the navigation device internal memory, and the updated map is installed onto a memory card, while the previous map has not been deleted. In this case, simply disabling the older map (through Menu->Settings->Map->Map Info->deselect the map) is not sufficient. Go to Menu->Settings->Map->Map Info and make sure that there are indeed 2 different versions of CarteBlanche Ukraine map installed on your navigation device. If there are any other additional maps (excluding CityNavigator NT maps) installed, please contact Carte Blanche Ukraine technical support service. If there are no other additional maps (excluding CityNavigator NT maps), proceed to the next step. Connect the navigation device to your PC via USB and wait until 2 removable disks appear in the Explorer: one corresponds with the navigation device internal memory and another with the memory card. Each disk should contain a Garmin folder with gmapsupp.img file. Check the size of each gmapsupp.img file. Cut the file sized about 63 MB or less and paste it outside the Garmin folder, or save on your PC as a backup copy. Disconnect the navigation device from the PC, reboot it and check its operation. In case the above procedure did not help, please contact Carte Blanche Ukraine technical support service. How to unlock the map? Please fill in the form. The 25-character unlock code will be sent to your email address indicated in the form. If you do not receive an email with the code in a long time, please check the Spam folder of your mailbox and revise your antispam settings. You may also try indicating another email address. What should I do if after I have entered Login and Password the windows are empty again? This may happen if Login or Password is not entered correctly. The next time the system may take incorrect values which have been entered earlier from the cache, and the situation may reoccur. To avoid this please press “Ctrl+F5” keys or click the “Refresh” on-screen button in you Internet-browser and enter the Login and Password attentively once more. In case you do not succeed, please contact our technical support service. I have lost the unlock code. What should I do? If you have a coupon with a relevant number and code, visit the map unlock page and fill in the form. You will receive the 25-character unlock code on the email address indicated in the form. If you cannot find the coupon, please contact the technical support service and indicate the internal Unit ID of your navigation device (Unit ID). Is it possible to unlock the map for another navigation device? When purchasing CarteBlanche Ukraine map you receive the right to use this map on one device. To unlock and use the map on another device you need to purchase one more license with a different code and coupon number. To update the map, you need to know the (Unit ID) of the navigation device and to receive the 25-character unlock code. Then you should visit webpage and choose Download an update. It is necessary to type or copy from the email the 10-character unit ID of the device into the upper line (Login/User) of the pop-up window. In the lower line (Password) you need to enter the 25-character unlock code. When typing the codes you need to have the “CapsLock” key activated. The code must include the dashes. Although the number of characters visible in the password line is limited, it should be taken into consideration that the printed characters shift to the left; they may be counted using arrow keys “<-“ and “->”. When copying the codes from the email, in order to avoid copying an extra space please select the text in the reversed direction (starting from the end of the code). If Login and Password are entered correctly, you will be forwarded to an update download page. Please download the update file and save it on the hard drive of your PC. Please make sure that the size of the downloaded file is equal to the one indicated on the update download page. To update the map please follow the instructions available on the update download page. What should I do if I need to update a map in the navigation device on which maps from different sets are installed? Garmin® navigation devices are designed so that with every subsequent update the maps which had been installed earlier are deleted. That means that you should install the full set of all the necessary maps every time. Addition of new maps to the ones installed earlier is not supported. However, this is not the case with the maps that have been pre-installed by the manufacturer. 1. Save each map in a different memory area, that is install one map onto the internal device memory and the other onto an SD card. 2. You can use Garmin® MapSource program to install both map sets on your PC for their usage with this program. After that please select the necessary areas for installation in each map set separately and install all the selected at once. The features of city search in Garmin® Nüvi navigation devices. The menu of the Garmin® Nüvi series navigation devices includes two variants of search: Where to -> Address for address search in the cities with detailed coverage including address database, and Where to -> Cities for the settlements without a detailed city map and address search. In the second case the device provides a list of the settlements sorted by the increasing distance from the point of cursor position on the map, within 20 km around the cursor. To find a more distant settlement please go to the map page (View Map), set a convenient scale, move the map so that the cursor is situated in the necessary area and click the “Set Loc.” on-screen button -> click the “Back” on-screen button -> click the “Menu” on-screen button -> Where to -> Cities. Then choose the needed settlement from the list. Is the house number displayed on the map? It depends not only on the map, but also on the navigation device itself. Please check it before purchasing a navigation device. How to set the displaying of safety cameras on the screen? Please copy the files in .gpi format into Garmin®/poi folder into the internal memory of the device or onto an SD card. If you find any inaccuracies on the map, please fill in the form. We will be grateful if you provide an up-to-date track and/or otherwise illustrate the map fragment. All notices will be considered by our cartographers and taken into account in one of the next map updates.